As is known to all, more files will be saved and less storage space will be left in your Android phone with time passing by. However, together with the useful files like contacts, messages, photos, apps, and more stored in your device, there are also a number of junk files lurking in your device including cache files, download temp files and more. And these files actually do nothing but take up precious storage space in your Android phone and slow the operation speed. So you have every valid reason to remove Android junk files at regular times. Can't distinguish between the useful files and useless junk files? No need at all! This Android Data Cleaner can do it for you! After successfully detect your Android device, it will automatically detect all the junk files existing in your device like photo caches, app caches, download temp files, app crash logs and more, and then display all of them on the main interface for your reference. And if you want to permanently erase something from your Android device, it is just a piece of cake using this software, be it contacts, messages saved in the internal memory or music, photos, apps and etc. saved in the external SD card. This software is very easy to use, since it offers an easy-to-understand interface for Android users. More importantly, it can be fully compatible with all Android phones, no matter which Android OS they are running. Below is the free trial versions of this software! So why not give it a try by yourself? It won't let you down! To start with, install and open the software on the computer. Then link your Android device to the computer via the USB cord. This software will detect your device and show you the main interface. Choose the right erasing mode to continue the process. After this software successfully detect your device, all the files saved in the Android phone will be displayed on one interface. You can then enter the tabs to preview more detailed information. 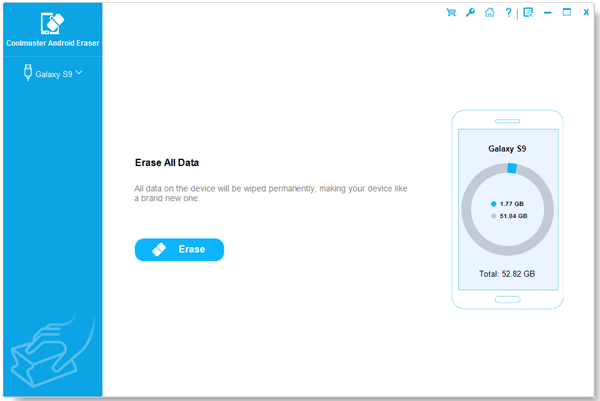 Then you are free to tick out the files you want to clean up from Android phones, and hit the Erase option to begin the process. This Android Data Cleaner is quite easy to use, right? So if you want to speed up your Android device and free up more space on your device, just get this software to give it a try by yourself! Android junk files cleaning can be as easy as a piece of cake with the help of this professional data cleaner!